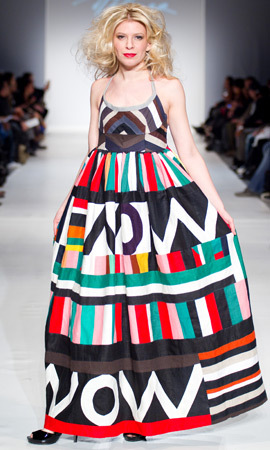 The perfect cure for winter is a walk through Joseph Helmer’s fall-winter 2010, a vivacious celebration of bold colours in patchwork. The Montreal-based designer relies on classic womenswear shapesâ€”hourglass, 1940s New Look, and even mermaid styleâ€”for his hand-sewn geometric patterns in boundless colours. With bare shoulders and backs, and accented with simple folds along the hips and knees, Joseph Helmer’s dresses charm and seduce without pretension. For non-fans of patchwork, Helmer also offers tweedy coats and jackets with wide lapels and slim waists, as well as fitted dresses in sateen brocade and loosely draped in iridescent lavender and royal blue. The collection is similarly unrestrained when it comes to menswearâ€”a cacophony of colourful checks and plaids in pared-down preppy shapes, from double-breasted pea coats to pants and scarves. There is relatively plainer outerwear as well, in neutrals like black and grey that reveal interesting details such as lopsided sleeve hems on a green and orange plaid coat. But it is the labour-intensive hand-stitched patterns that showcase this unique designer’s talent, who showed this collection as a fundraiser for Haiti relief efforts.